AudioFile: I’m assuming the cross-outs will be in the final book? What a great way to create voice! How did you come up with that idea? How do you see this working in audio? LHA: Yes, the cross-outs (strike-throughs) are very deliberate; in fact, they are a critical clue to understanding the main character’s struggles. I decided that strike-throughs gave a stronger visual impact than the typical narrative devices. (I wonder if this could be considered a palimpsest? I’ll have to ask one of my smart English teacher friends.) I first saw them used on blogs and realized they were the perfect device for an unreliable narrator who cannot be honest with herself. While I was writing, I must confess that I did not consider the challenge the strike-throughs would create for the audio version. I think the best approach will be to speak the strike-through words softly. But I’ll leave that decision up to the experts! AudioFile: One of your gifts is creating books with voice…from picture books like Thank You Sarah The Woman who Saved Thanksgiving to Wintergirls. Do you hear your characters speak in your mind? Are you an auditory person? LHA: I am a very auditory person. I was a language & linguistics major in college and I pick up accents and new languages quickly. There is something about the shape of a spoken word that resonates within me. Storytelling is traditionally an experience shared by the speaker of the tale and the listener. Written text is a relatively modern construct that doesn’t always carry the same impact of the spoken story. I can make a lot of notes about a book but until I can hear the character talking in my head, I can’t write it. You could say that my books are audiobooks first, which I then translate into visual text. I think that’s why I am so particular when it comes to listening to audiobooks. If the narrator’s voice doesn’t ring comfortably inside my skull, I can’t listen to the book. AudioFile: Do you listen to audio? Any favorites? Have you heard audios of your books? What are your thoughts about how audios translate, or transform your books? LHA: I like to listen to books when I’m gardening, particularly weeding or plucking nasty insects off my tomatoes. I adore the recordings of Geraldine James. In fact, I prefer readers who don’t have American accents. I’m not sure why. I never read my own books after they are published, though I have listened to snippets of each of the audiobook versions. So far, Madisun Leigh’s recoding of Chains (Brilliance Audio) is my favorite. Brilliance is recording Wintergirls, too. I’m very excited to hear what they do with it! AudioFile: It’s almost as readers become your characters, and maybe that’s because you do. Is that true? What was your teen life like? Was there anything in your teen life that motivated your writing in this way? LHA: I was a confused and depressed teenager. My family went through a very rough patch during those years and nobody would talk about what was happening to us. I completely understand the struggles so many teens have to cope with. I hope my books accurately reflect their pain and their path to uncover their strength. AudioFile: All your books have a driving force. They can’t be put down! To be honest, I hated reading on computer, didn’t want to print out the whole book. When I complained my husband said…”just don’t read it” and I told him “I can’t stop!” Do you have a sense of creating this, or does it just come? LHA: That is such a huge compliment – thank you! I’m not quite sure how to analyze it….. a lot of my writing process is a complete mystery to me. You are so in Lia’s mind and heart. Can you tell me about how you got there? LHA: Honestly? I didn’t get there. She got into me. There is some of me in Lia’s character, no doubt. I’ve fought a bad body image most of my life, though I was never as close to the edge of death as Lia is. But her voice in my head is very distinct from my own. 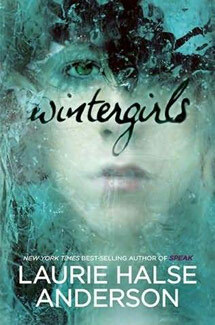 By the end of the book, I felt like Lia was haunting me, much as Cassie haunts Lia in the story. It was a little unnerving. AudioFile: What are you working on now? LHA: I am writing Forge, the historical novel that follows Chains. That will be followed by a third historical that finishes the adventures of the characters from the first two books. It is tentatively called Ashes. I’m also working on a picture book about Abigail Adams, and exploring new characters and stories for my next YA novel. AudioFile: What’s it like to go back and forth from YA to picture book, from historical like Chains to contemporary like Wintergirl? Is it easy to choose book forms? How do they come to you? What does the variety give you as a writer. LHA: I love jumping back and forth between the forms. I think it keeps each book fresh and exciting for me because I don’t have to grind out the same-old, same-old all the time. I think that the best parts of my stories are written in my sub-conscious brain, anyway. My sub-conscious prefers to play in a different pasture than my conscious self. I can’t imagine doing it any other way.